If one makes a comparison between a Koi pond system and a house then filter system is obviously the ‘lavatory of the pond’. Whilst many still state that the origins of our modern day lavatories were first described in the mid 1500’s, there can be no doubt that it was a certain Thomas Crapper who later developed the original ideas and then promoted them to UK and the world then followed. Before these wonders came onto the scene it is not worth even imagining what had to be carried out before he provided an excellent final solution to it all. Because today we have all grown up with derivatives of the invention since birth it is simply viewed as the norm when, at the time Thomas Crapper launched his ideas, they were futuristic beyond belief. 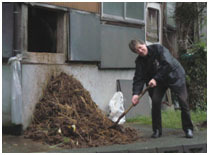 He knew what his aims were and these were simple – he wished to collect and then remove human excrement to waste as rapidly as possible and, at the same time, try and remove the ever-present noxious odours that were associated with it. He also knew, that to begin his endeavours, he would need a suitable receptacle (box) and then connect it to a sewage outlet in some way. Offensive odours were partially removed successfully by incorporating a simple ‘P Trap’ in the line twixt box and sewer which provided a barrier that would not allow odours from the sewer below to be allowed to creep back upwards into the house. Whilst he was fully aware that human excrement consisted of both solids and liquids he had no need to make any differentials as he knew both parts had to be disposed of as quickly as was possible. As some of the solids could be of significant size (sorry) – he also needed his box to sewer connection to be of large enough bore to allow them to pass freely away – again, with some speed. 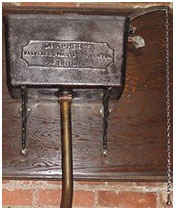 He designed his box to be of sufficient size and depth to hold a single deposit comfortably and then start the removal to waste via a 4” bore pipeline by adding weight of water from above to flush out the offensive matter and replace it all with fresh, new water by way of a flush assembly connected to a reservoir above the lavatory. At the end of all his trials and tribulations it worked superbly and his box was formed from highly glazed earthenware in a distorted ‘conical’ shape – the narrow outlet at the base of the cone was then connected to the inlet of the pipe leading to the sewer. We all know that, despite the glass-like finish of the glaze, there were some times where extra attention would be required and this was met with the ever-popular toilet brush. After all of this, whenever a perfect flush had been completed, the box held fresh, clear water and was ready for the next deposit when, once again, the lavatory would become ‘engaged’. A filter box on a Koi pond has incredible similarities to the Crapper design whereby both solids and liquids require handling. As far as the solids are concerned we need to dispose of them exactly in the same way as per the Crapper design – namely, dump them as quickly and as often as possible. However the valuable contaminated liquids deposited need to be retained in order to pass them over inert surfaces and then provide vital food supply to a biomass that will later form on these surfaces and then be converted to water free from harmful contaminants before being returned to the pond via a water pump. It is obvious we need a two-stage process; absolute perfection would be that ALL solids are taken to waste at the first pass in the first stage and the contaminated, yet ‘solids-free’ water is allowed into the second stage for processing. Alas our modern-day technology is still not anywhere near perfection unless significant areas of space and significant amounts of money are available in order to realise this. No doubt, we need a ‘barrier’ or a ‘trapper’ or a ‘catcher’ here. We also need a box to contain it and it really should be ‘big enough’ without being ‘too big’ – it also requires a method of dumping ALL the solids to waste as quickly as is possible. In our Koi ponds it is also vital that we can dump this with the minimum wastage of water along with the solids because large volumes of discharged water result in a drop in pond level that can be too low for the suction inlets of the pumps – thus we have to add significant amounts of new water before the system can be re-started. Back to barriers – the best and most efficient of all, (unless one has spare thousands requiring spending) – is Diatomaceous Earth that costs pennies. Alas, as mentioned elsewhere on this site, this is TOO efficient and within minutes of normal usage it requires replacement, as even water can no longer pass through. Yes there are other options not quite so efficient, items such as drum and belt filters, pressure vessels, sieves, brushes and the likes but they are not really as efficient as we would like them to be – especially when it comes to finding out their ability of discharging the solids caught to waste IN TOTAL. The belt and drum filters do not require discharge as such because old surfaces are thrown away but still some debris escapes unless we wish to spend thousands more on a much more sophisticated unit that would take up the size of an average garden. In my experiences over the years, the most efficient mechanical invention was James Hosford’s unit that I named ‘The Answer’ after giving it serious trials. Virtually nothing of note escaped the unit and the incoming debris shrugged off by the screen was deposited for removal and could be seen to be removed completely after the required discharge. Yes, it could have been improved upon as can almost anything, but the idea was excellent – sadly this is no longer available. How about a suggestion then? Why don’t we just accept the fact that all our available ‘barriers’ will just ‘work’ to a degree? Whilst some are far more efficient in ‘trapping’ than others, others are far more efficient in ‘removal’. As an estimate, I reckon that the better mechanical options before us will prevent 85% of solids passing through the first stage of our box and 15% will escape. The latter will find its way into the second stage where we do not wish it to go, some will settle here (12%)? and (3%)? will be returned to the pond and follow through again on the next pass. If we do accept this and we also accept there is a significant amount of ‘fine dust’ being constantly deposited in the same stage by the dead biomass, then there is obviously a need for a suitable drain in this stage. This further requires a ‘second-stage box’ design that also allows complete removal of all this waste. Now to return to the household lavatory, in a normal household perhaps there are up to 20 short periods in a given day where the ‘engaged’ sign is in force and after each of these visits the loo is left to be brand new because it is immediately flushed to waste after each usage. Thus endeth similarities between lavatory and filter box. Our box is ‘engaged’ the moment the pump is switched on and remains to be ‘engaged’ until the pump is switched off and, whilst the size of the visible debris is nowhere near the size of our visible lavatory debris, it enters our box almost constantly. Throughout the time our box is ‘engaged’ this debris continues to build up which is not really desirable. In small but well-stocked Koi ponds in the warmer months, the daily volume of this visible debris could almost equal that of a lightly used lavatory. It is then that I ask myself the question ‘Should we not also be pulling the chain to our boxes with some regularity’? I would expect all replies to this question to be a resounding ‘YES’ unless it is acceptable to leave our lavatories un-flushed for long periods of time. In both examples it is all plain hygiene and common sense! If the truth is known, we Koi enthusiasts should flush our boxes/lavatories daily, we should also be able to see, with our very own eyes, that once flushing is complete then our boxes are once again brand new and nothing at all is concealed from view nor do we have to work on advertised assurances from some quarters stating ‘everything will all be flushed to waste with every discharge’. Unless I can witness this personally, as far as I am concerned it is lies – until someone proves otherwise to me and shows it to my eyes to confirm! It is at this point I feel the picture is required once more! And now to continue. Most large Koi ponds have equally large filter boxes whilst many others have a series of deep filter boxes. It is not reasonably possible to ask the owners of these to dump the lot on a daily basis, a twice-weekly basis, a weekly basis or a monthly basis because of time required, water lost and new water required before the system has reached the required level for re-starting. However, whilst this is not ‘reasonably possible’ it is unfortunately ‘absolutely VITAL’ for the following reasons. Whilst the hygiene aspect is painfully obvious and despite claims of ‘perfect water readings’ that are present, there is another aspect involved in all of this that cannot be determined or attained by any scientific test kits. This hidden aspect is something I have accepted for many years and is something not easily explained, it can be present on a pond today but not present in six weeks and I simply refer to it as ‘Koi Water’ and it is a joy to behold – the Koi in the pond also know this well. Before any manufacturer of boxes for Koi ponds can even get near to what is really required of a perfect box they must first understand what is needed in the keeping of high quality Koi as opposed to general-grade Koi and this takes many years of experience and understanding. It is the difference between keeping a pet pony to ride on for pleasure against keeping a thoroughbred racehorse, in short a world of difference. I am also fully aware that today, whilst the vast majority of newcomers to the hobby are happy in collecting ‘garden centre quality’ grades there are some others who still wish to add quality Koi to their prized collections. ‘Sandpaper skin’ – my name for another complaint that does arise. These three downers will never be witnessed at Koi breeder’s outlets in Japan but more of this later. I will go into these problems on another part of this site in detail but the real reasons for all these significant conditions that can instantly reduce the value of a Koi overnight by 95% all point to one word and that is the FILTER. Whilst it may well be ticking the two boxes as far as clarity and read-outs are concerned, the ‘KOI WATER’ is not present nor will it ever be unless serious attention is focused on the filter/lavatory. Incidentally ‘Koi Water’ does not differentiate between any ‘grade or quality’ of Koi, it really only affects high quality pigmentation – but it does produce the best possible conditions for ALL of them! As to the best possible filter I know of at the present time this is not only what is used inside the box and how it is used, it is also the box itself and its dimensions that are equally important. Before I cover the box in question I am assuming the following obvious requirements are met in full. One drain to One filter to One pump. Without ALL of these present, even the best box in the world will be seriously compromised.